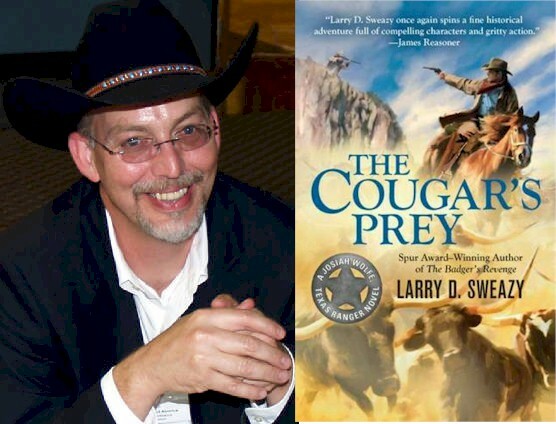 Larry D. Sweazy Wins Will Rogers Medallion Award for Western Fiction Again! Larry D. Sweazy's The Cougar's Prey (Josiah Wolfe #4) won the 2012 Will Rogers Medallion Award for Western Fiction, making the Josiah Wolfe series a two-time, back-to-back winner since Sweazy's novel The Scorpion Trail (Josiah Wolfe #2), won the 2011 Will Rogers Medallion for Western Fiction. The Will Rogers Medallion Award is presented each year to those books that represent an Outstanding Achievement in the publishing of Western Literature. They are books that exemplify outstanding excellence in content and design with an enduring quality that preserves and celebrates the history and spirit of the West and the memory of Will Rogers. 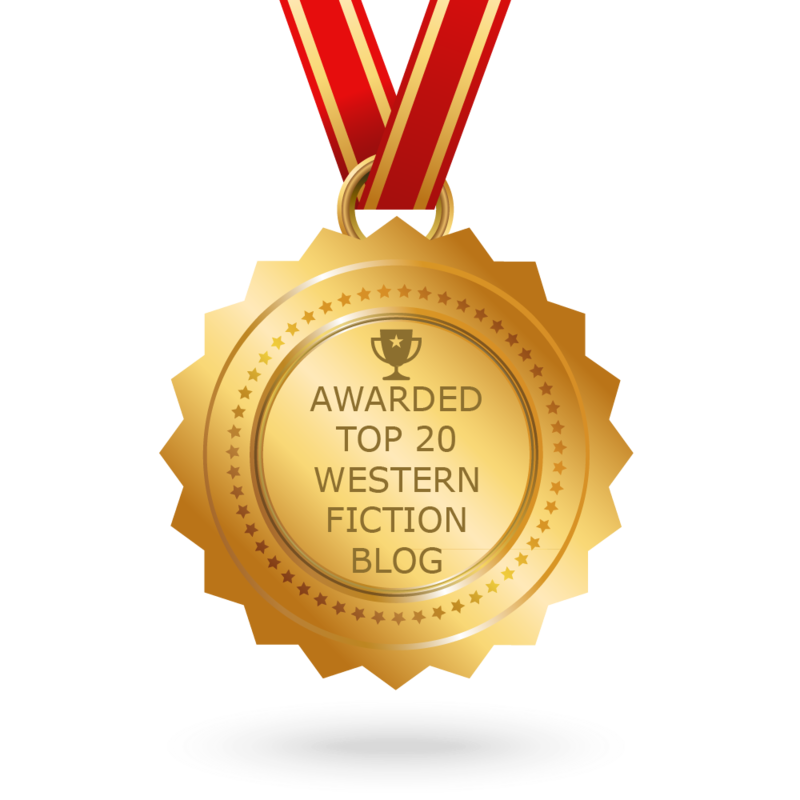 We stalwart guardians of literary excellence here at Western Fictioneers have been cooking up a secret for readers, for months now. We’ve dropped a hint here and there, but given few real details. Now we are unveiling our project, and there is no more need for our members to keep mum. WF is producing a new series of western novels, under the umbrella title Wolf Creek. 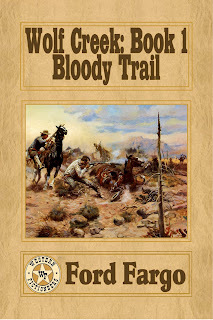 The series gets its name from its setting, the fictional 1870s town of Wolf Creek, Kansas. 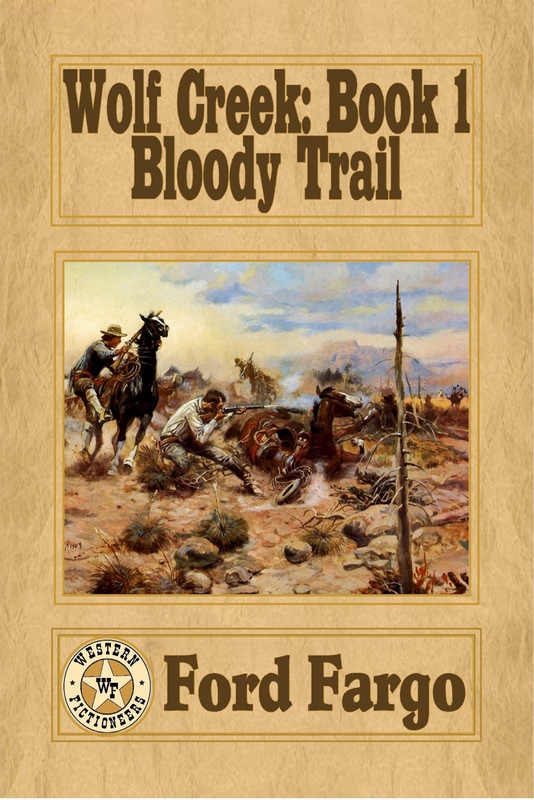 The first installment, Bloody Trail, will be released on September 1, with a new volume to follow every three or four months. Well and good, you say. But there are plenty of western series out there, some of them darn good. What sets this one apart? We can honestly say, Wolf Creek is not like any western series you have ever read. Every WF author involved in the project has created one or two “main characters” from whose perspective they will write, making this a large ensemble effort. This type of venture has been tried before in other genres –especially in “shared universe” science fiction series, the most successful of which was the 1980s Thieves’ World books. But it has not, to our knowledge, been tried with a western –and certainly not on this scale, or in this particular manner. The idea for this series came about last fall, when we were tossing around ideas about what our next WF anthology could be. Someone suggested a collaborative novel, and from there we thought: why not make it a whole series of collaborative novels? Since then, however, I have realized that the earliest seeds were planted at our very first WF organizing meeting, in Knoxville in 2010. Several of us were discussing the popular western video game Red Dead: Redemption, and how we might go about pitching an idea to publishers about an anthology of short stories set in that universe. That idea never got off the ground, but we have come up with something better. We have created our own fictional world, that we can all play in –at the same time! And believe me, we have some exciting, action-filled stories coming up for you.